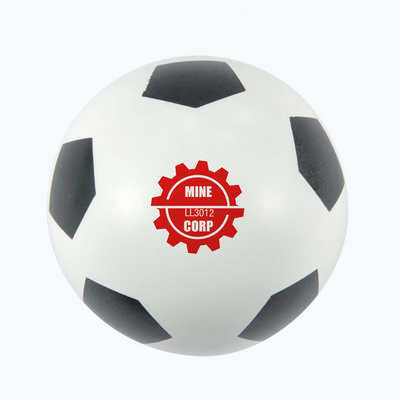 Soccer Ball hollow high bounce ball with gloss finish. Suitable for games, handball, catching, throwing, bouncing and an exercise ball. Colours - White/Black Size - 60mm Diameter Decoration Area(s) - Pad Print : Front - 30mm Diameter, Black panel omitted to maximise print area on white background; 4CP Digital Direct Print : Top/Bottom - Circle 25mm Diameter, Black panel omitted to maximise print area on white background. Price includes : 1 Col 1 Pos Print. Setup is included.